Queensland can have some very extreme conditions for landscape plantings, wet, dry and high humidity can cause problems for a lot of plant species. Lomandras are a notoriously tough plant, but not every lomandra variety is suited to the Queensland climate. This article will show which are the best lomandras for Queensland, even ones that are phytophthora resistant. 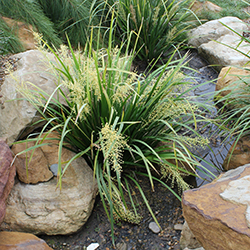 This entry was posted in Australian Native Plants, Drought Tolerant Plants, landscape lomandras, Landscape Plants, Landscaping, Landscaping Plants, Lomandra, Lomandra fluvialtilis, Lomandra Hystrix, Lomandra Longifolia, Lomandras, Mass Planting, Ozbreed, phytophthora resistant and tagged Drought Tolerant, humidity tolerant, landscape plants for queensland, landscaping lomandras, lomandras for qld, phytophthora resistant. Bookmark the permalink.